In honor of Veteran’s Day, and in the ongoing commemoration of the centennial of World War I, today’s post features the Ames Ambulance Unit. This unit consisted of 36 Iowa State College (University) students who volunteered and served on the Italian-Austrian front from 1917-1919. Wounded being removed from bottom of aerial cable way in the Valley of Santa Felicita, Italy, circa 1918, RS 13/16, photo collection box 1103. On April 6, 1917, U.S. President Woodrow Wilson declared war against Germany, officially entering World War I. In May, U.S. Secretary of War Newton D. Baker authorized the formation of the U.S. Army Ambulance Corps and looked to universities across the country to organize volunteer units. Iowa State University was asked to raise a unit of 36 ambulance workers. Nearly 100 men applied and underwent physical examinations as well as tests of their mechanical knowledge, specifically relating to Model T operation and repair. After the 36 men were selected, they began training in first aid, military tactics, automobile operation, and elementary French. Wounded coming down the aerial cable way in the Valley of Santa Felicita, circa 1918. RS 13/16, photo collection box 1103. The men enlisted on June 4, 1917, and left for training in Allentown, Pennsylvania, on June 10. Training continued in Allentown for a year before being deployed in Italy. The unit served in Italy until early April 1919, transporting sick and injured soldiers from the front. Harold Benson and Eugene McKibben, drivers in the unit, wrote a chronology of the events of the unit, in which they describe a period of intense action, beginning October 24, 1918: “Offensive opens along entire Italian Front from Lake Garda to Adriatic – Fourth Army spearheads attack up Brenta River – Every ambulance kept busy for next two weeks, Pierce and Dodge trucks pressed into action hauling sitting wounded. As fast as Italians advanced, our posts left Col del Gallo San Felicite and Pove, and moved up Brenta to Feltre, Cismon Primolano, Grigno and Strigno over shell-pocked, camouflaged roads packed with italian infantry and artillery, and miles of Austrian prisoners being marched out of the mountains” (RS 13/16/1, Department of Military Science Subject Files, Box 1, Folder 19). Ames Ambulance Unit post in Valley of Santa Felicita, Italy, Near Mount Grappa, circa 1918. RS 13/16, photo collection box 1103. Armistice was declared November 4 on the entire Italian Front, but the ambulance unit continued its work evacuating soldiers until early April 1919, when they left Italy for France to ultimately return to the United States, to be discharged May 7. In recognition of their service, the Italian government bestowed on the unit the Italian Cross of War. Reunion of the Ames Ambulence Unit in 1963. 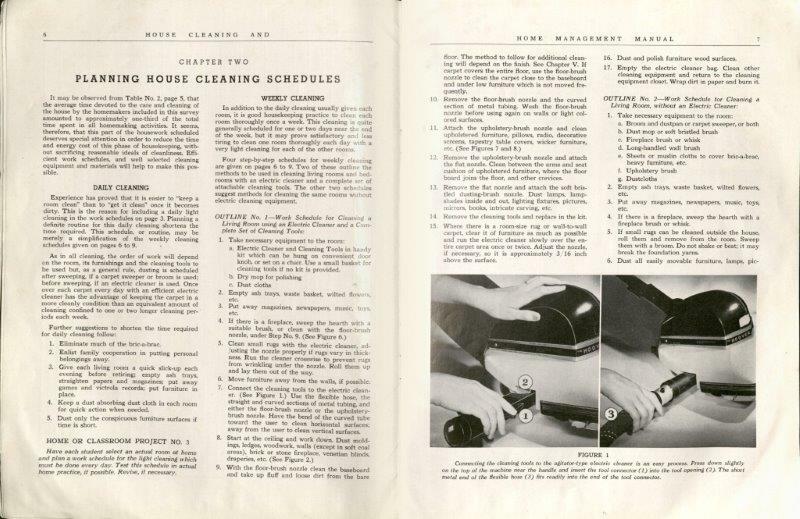 Printed in the December 1963 Alumnus. For more information on the Ames Ambulance Unit, see the Department of Military Science Subject Files (RS 13/16/1). World War I began in the summer of 1914 and ended in 1919. The United States joined on April 6, 1917 with a declaration of war on Germany. When the United States joined it had a standing army of 133,000. By early June 1917 approximately 9.5 million men had registered for service. 114,000 Iowans enlisted and Iowa State students, staff, faculty, trainees, and alumni formed around 6000 of those serving in World War I.
Iowa State University responded by providing space, expertise, and infrastructure for training soldiers in a number of areas the largest being infantry, engineering, artillery, aviation, and “special.” The majority of these were men, but 29 women from Home Economics also served. 11 were nurses, 10 were dietitians, two were laboratory technicians, and one was a yeoman. One of these women, Pearl Wesley Yates, is remembered with a Gold Star. If you’ve been to Memorial Union you have probably passed through Gold Star Hall which lists the names of Iowa Staters killed in World War I and subsequent wars. The symbol of the Gold Star was chosen to represent fallen soldiers when President Wilson approved a suggestion by the Women’s Committee of National Defenses for women to wear black arm bands with a gold star for each family member who had died during the war. The campus community in the post-war period formed a not-for-profit corporation (the Memorial Union Corporation) to raise the funds for the building of the Union. Near the Union is a rock plaque inscribed “Dedicated to the men whose lives were lost in World War I.” 119 Iowa Staters killed during World War I are remembered in Gold Star Hall. You can find out more about the lives of the 119 through the informational kiosk at the Union. The kiosk is intended to provide more context and personal information about each person memorialized in the Hall. It was developed by Iowa State graduate student Stelios Vasilis Perdios and based in large part on material found in Special Collections. Iowa State continued working with the military after the war was over by developing retraining programs for disabled veterans. These courses were designed to provide support to veterans who had not previously had college preparation. The classes were primarily focused on agriculture with topics such as “Elementary Beekeeping” and an individualized course of study in Animal Husbandry. Whitney’s recent post regarding the poetry of Iowa-related music has me in a musical mood. Studies have found that music can be motivating, which comes in handy on April mornings that arrive with snow on the ground. And the benefits of music education are widely espoused. 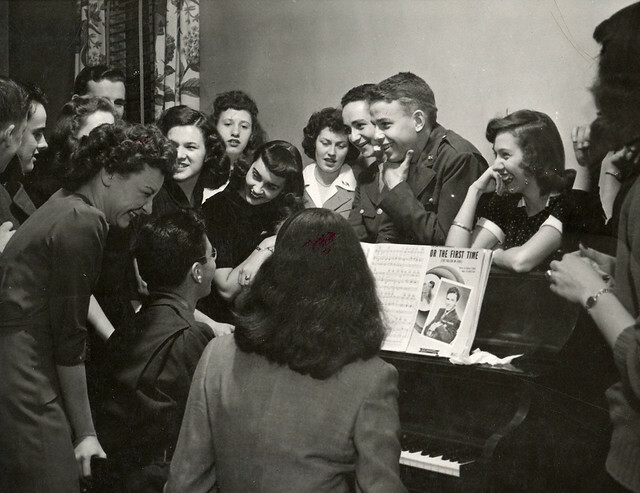 The group crowded around the piano below are demonstrating the social benefits of music in 1944. Ames Town and Gown Chamber Music Association Records, MS 350. This collection documents the administration, activities, and performances of this local group that has been operating since 1949. Extension Music Program Records, RS 16/3/3. This collection documents Iowa State University’s Cooperative Extension programming that brought musical and cultural activities to the homes of rural Iowans. John H. and Helen Wessman Sheet Music Collection, MS 377. John H. Wessman is an ISU alumnus (1941) who played viola in the ISU Symphony and sang with the Chicago Swedish Glee Club for eleven years. This collection contains sheet music from the 1850s to the 1880s. Jimmie Howard Reynolds Papers, RS 13/17/61. This collection contains biographical information, College Band Directors National Association materials, professional correspondence, and teaching materials from Jimmie Reynolds, who served as ISU’s director of bands and an associate professor of music for ten years, 1972-1982. Roger M. Goetz Papers, RS 21/7/223. Roger M. Goetz, a graduate of ISU (1962, 1967), had an active career in Lutheran ministry. In addition to sermons, clippings, and biographical information, his collection contains sheet music and programs that document his career as an organist. Department of Music collections are listed here, and other manuscript collections from are listed here. And of course, you can always come visit us in Parks Library to get inspired by the music! The Special Collections Department is lucky to have some wonderful students working here, and they do a lot of work processing our collections. 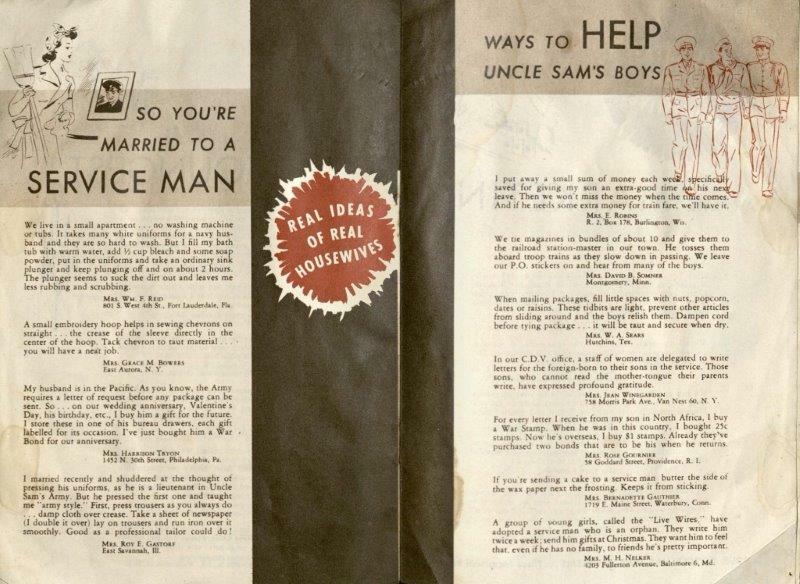 Rachel Kleinschmidt, a graduate student in History, recently processed the Henry Montgomery and Bernice Bernard Black Family Papers (RS 21/8/12) and has written the blog posting below. Since the 68th anniversary of D-Day is coming up in a few weeks on June 6, and Memorial Day is today, we thought this would be a good time to highlight this collection. On Memorial Day, we think about the sacrifices that men and women have made by serving in the military. The Special Collections Department is home to the collections of many important ISU alumni and veterans, including Henry M. Black. Henry M. Black (above), member of VII Corps Headquarters, 9th U.S. Army, receives oak leaf cluster to his bronze star medal from Lt. Gen. J. Lawton Collins, commanding general, VII Corps, at a ceremony in Leipzig, Germany (photograph from Box 16, Folder 4). Henry Montgomery Black was an Iowa native, born in Reinbeck, Iowa in 1907. He attended Iowa State University (then Iowa State College) from 1925-1929, majoring in Mechanical Engineering. He then furthered his education with a Master’s degree from Harvard University in 1934. Following his time in college, Henry Black served in the United States Army. His experience as an engineer was put to use by the Army Corps of Engineers, and Henry served as the chief engineer of the Utah Beach landing during the Normandy invasion in 1944. His service was rewarded with a Bronze Star, a Legion of Merit, and a Croix de Guerre (pictured below). Henry would eventually retire from the army at the rank of Colonel. In the meantime, he returned to his alma mater (Iowa State) to serve as the Head of the Mechanical Engineering Department from 1946-1972. Because of his impact on the Iowa State Engineering Department and campus (he was instrumental in helping build the university’s mechanical engineering program into one of national prominence), a building was named in his honor. Black Engineering Building was named in 1987. Henry Black was not the only member of his extended family to have a distinguished military career. His father-in-law, Ransom Drips Bernard, served in World War I in the Army medical corps, eventually attaining the rank of Captain. Ransom was not an Iowa State graduate, but his wife, Bernice Corlette Bernard graduated with the class of 1904. Both Henry and Ransom documented their service through letters to family back home. These letters, along with many photographs and artifacts like those mentioned above, can be found in the Henry Montgomery Black and Bernice Bernard Black Family Papers, RS 21/8/12, in the Special Collections Department. The collection documents several generations of the Black and Bernard families through artifacts, photographs, scrapbooks, and correspondence. Bernice Black Durand (left) and Rachel Kleinschmidt (right) going through the Henry Montgomery Black and Bernice Bernard Black Family Papers (RS 21/8/12), which Bernice donated to the department and Rachel processed. Rachel (right) showing Bernice (right) the processed Henry Montgomery Black and Bernice Bernard Black Family Papers in the storage area. Interested in finding out more about the collection? You can read the finding aid online, and then come visit the Special Collections Department (open M-F, 9-4) and let us know which boxes you would like to see! We have a number of veteran’s collections here documenting both alumni and other Iowans’ service to our country. In addition, we also have records related to Iowa State’s Department of Military Science (see the 13/16 listing in our online inventory). One way of finding some of our veterans collections is through our subject guides, which contain a listing of manuscript collections related to the Civil War, World War I and Word War II. 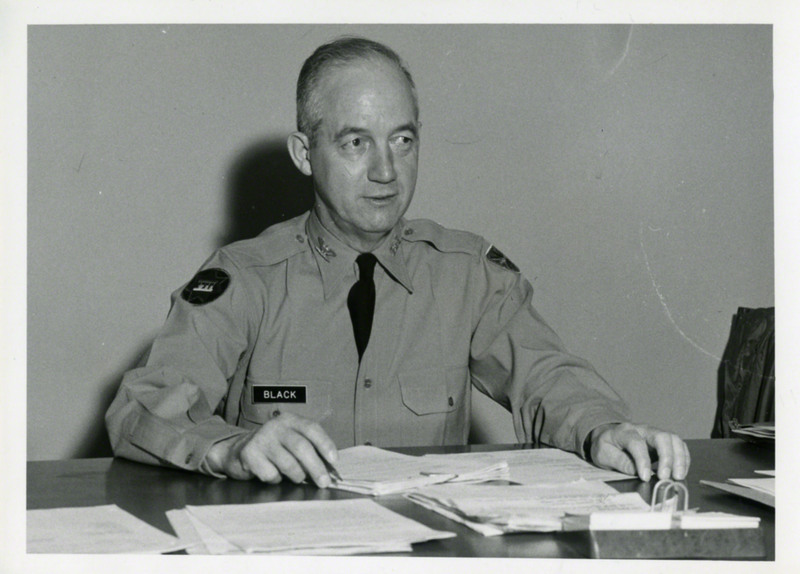 One of our veteran’s collections include the Fred O. Gordon Papers (MS-666). Gordon served during World War I, and we have a small collection which provides a brief view into his service in Europe. Fred Otto Gordon was born October 24, 1894. His parents were George and Martha (Hyde) Gordon, and the family lived in Arlington, Iowa. He enlisted in the U.S. Army on April 9, 1918. After completing a training course for electricians at the University of Wisconsin-Madison, he was promoted to the rank of Sergeant and sent to Europe in July 1918. He was assigned to Battery F, 119th Field Artillery. Wounded on October 1, 1918, he returned to the United States in April 1919 and was discharged from the Army on May 20, 1919. Two pages from the collection’s photograph. In addition to the photograph album, there is also folder of loose photographs. 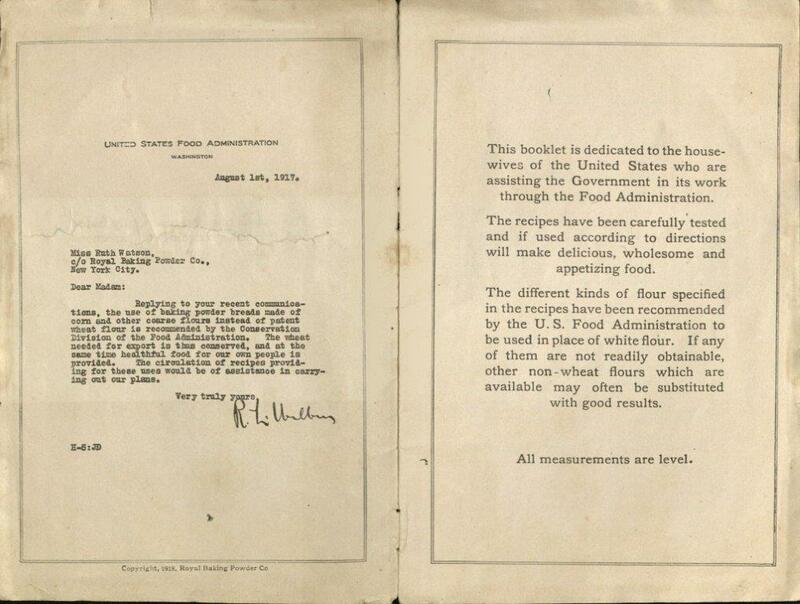 The World War I material includes a diary, correspondence, selective service and training certificates, a pay record book, newspaper clippings, and photographs. The diary covers the time from Gordon’s enlistment until his discharge and records events such as the sinking of a submarine while on ship for Europe, artillery action, and being wounded and taken to the army hospital. The diary, containing very brief entries at the back of the notebook, also includes notes about conventional signs and army codes. Although only a few pages in length, Gordon’s diary contains enough detail to give the reader a window into one Iowa veteran’s experience. For instance, one day’s entry states that he was in Paris and saw the Eiffel Tower, and the next entry (thirteen days later – August 29) he has experienced his first bomb and shell fire. In addition, many of his entries contain the length of marches, or “hikes,” as he often calls them. Many were impressively long for a single day, and there are quite a number which were done in the rain. If you are interested in taking a look at this collection here in our department, please visit the collection’s online finding aid, which will provide you with a more in-depth description and folder listing of the collection’s contents. 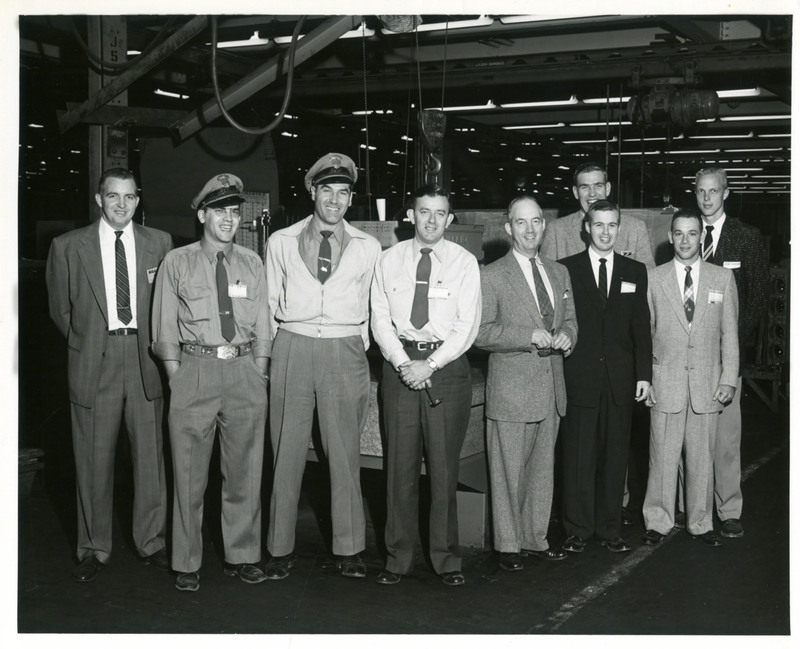 We have a few personal papers of our veterans here in our department, but the national military service records are housed at the National Personnel Records Center (NPRC) in St. Louis, MO. Check out the blog post by our Archivist of the United States, David Ferriero, to find out about the process of requesting a copy of a military service record – and a little about Ferriero’s own military service record housed at the NHPRC.